Time out....movements to help you calm the F down! I'd like to say that as my kids have gotten older I've learned to handle stressful situations with the grace and ease of Maria Von Trapp....but let me tell ya, sometimes I just want to run into that giant mountain field and never come back! Okay, well that might be a bit dramatic and it DOES get a bit easier to find some time for self care but what I've realized comes in really handy are some GO TO stress and anxiety diffusing tools. For a lot of us we get stuck in our head worrying and fixating on things that are, for the most part, beyond our control. So getting out of our head and re-connecting to the present moment through our bodies is really helpful. Here are some tried and true, simple and effective movements that you can do if you just have a few minutes or want to spend some serious alone time to rest and recharge. This is a super simple and quick way to get you out of your head and into your body. Sometimes all we need is a little touch therapy, so why not do that for yourself. Grab a tennis ball and use it as massage tool. With gentle to medium pressure roll the ball along your chest, being aware to roll above your breast and below your collar bone. If you don't have a tennis ball use your finger tips to gently tap across your chest (same as above). Rolling the ball on your feet is a great way to help you feel grounded. Our feet have a ton of receptors in them so they receive the calming cue right away...which comes in very handy! Again, grab a ball and roll it around on your feet looking for places of tension or just give your whole foot some love. Moving from your heel to the toes. Here's a go to for when I'm feeling overwhelmed! It's kind of the adult equivalent of throwing a temper tantrum. And just as therapeutic and effective! Bring yourself down onto the ground and shift your bum back to sit as comfortably as possible onto your heels. Place a rolled up blanket or pillows under your knees if you can't rest your bum back comfortably. Applying some pressure to your forehead can be really calming so if you're head doesn't rest on the ground, grab a yoga block or a few books. Take at least 10 breaths in the pose allowing the breathe to flow easily. Don't worry about how deep the breaths are, just let it happen. Bridge is a great way to allow blood flow to return to the vital organs and help you feel really grounded. 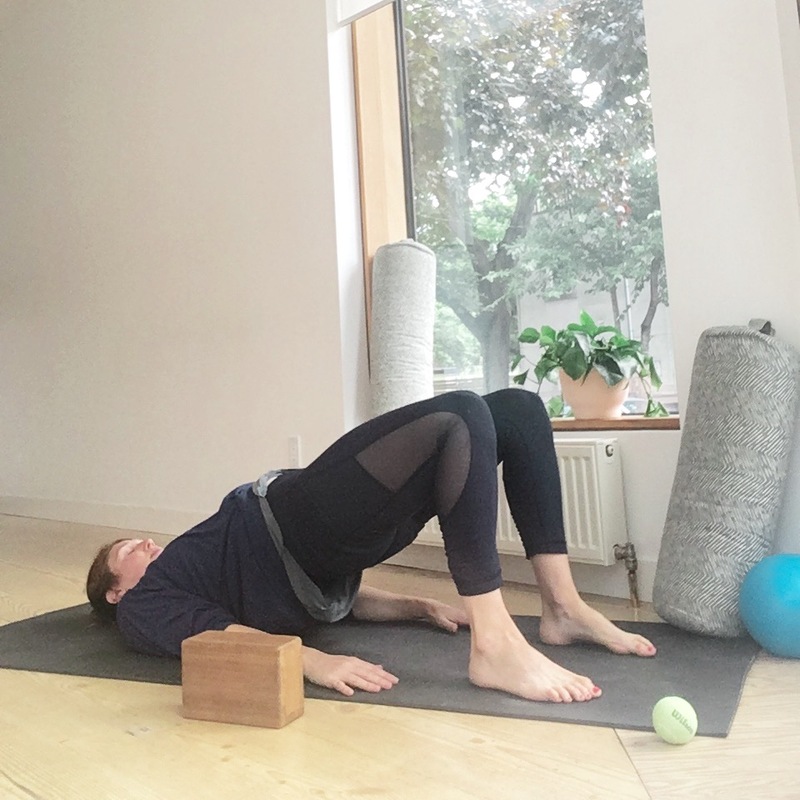 Having your head lower than your heart is very calming and if you use a block underneath your sacrum this pose becomes very passive and restorative. Sometimes moving with our breath is really helpful so try rolling up, vertebrae by vertebrae as you exhale and slowly rolling back down as you inhale. PREGNANCY TIP: This may not be the most restful position for pregnant bodies, so try a seated or standing forward fold, allowing your body to rest toward the ground. In seated-bring your feet together and allow your spine to round forward, allowing your head to relax completely. In standing, drape your spine toward the ground with a slight bend in your knees, keeping your head relaxed. We often tip into the sympathetic nervous system when we're stressed and anxious. Which keeps our body on high alert and in fight or flight mode. Our bodies often tense up because it's constantly on guard, so releasing tension in your legs is a good way to help send a message to your body (and mind) that it is okay to relax and let go. There are plenty of leg stretches that will help send that message but this one just feels so good and is fairly passive while providing a nice release for the spine to further help release tense and overworked muscles. You can use a yoga belt, a tie, scarf, theraband, whatever you've got around the house for this one. PREGNANCY TIP: Prop your upper body up with some pillows or a yoga bolster if you're not comfortable lying flat on your back. Keeping with our theme of releasing tension give this glute stretch a try. This is super easy to do wherever you are. You can do this seated if you're at work or lying on the ground if you wanna stay with the more passive vibe. Cross one foot over the opposite knee and gently tip your upper body forward. Take some nice full breaths here, imagining the tension melting away. PREGNANCY TIP: If you are experiencing SI joint issues this is not the best pose for you. Use a tennis ball to roll out the glute muscles, either against a wall or down on the ground. I hope you find these movements helpful when you're in a moment of anxiety and stress. It's hard to know what to do with yourself in those moments as we can feel paralyzed by fear but trying to get out of that place of swirling doubts and fears in our mind is really important. If all else fails just take a moment to feel your feet on the ground. To feel your hands on your body. To notice your breathe. It won't solve all your problems but hopefully you'll feel less like running toward the mountains Sound of Music style.